Many business owners choose to go the DIY route when it comes to SEO. Because let's face it: it isn't cheap to hire an amazing SEO professional! I get it and have been in the same situation as you building up my business. Over the past year I've been growing a bit, so I've been taking on a bit of this myself. There may come a time however, when you need to admit to yourself that you're out of your element. If any of the signs below sound familiar, it may be time to wave the white flag and hire an SEO expert! I was talking to a business owner the other day, and he mentioned that he knows he needs to work on his SEO. Problem is, he assumed all that job would entail is taking a day to update the fields in his SEO plugin. While some SEO tasks can be updated in a day, achieving high rankings takes a long-term SEO strategy. Once you've optimized your site, it will take an average of 4-6 months to start seeing results. At that point, you'll likely need to tweak some of your strategies, or even change them all together. In other words, don't expect to take a day or weekend to "do" your SEO, and then expect it to work for your site. If this is your expectation, it's definitely time to consider hiring an expert. Manual actions are no joke. You have to know the rules and play by them. A penalty can seriously hurt your traffic, rankings and bottom line. Unfortunately, even the most ethical business owners can be slapped with a penalty - even though the owner didn't intentionally do anything against the rules. 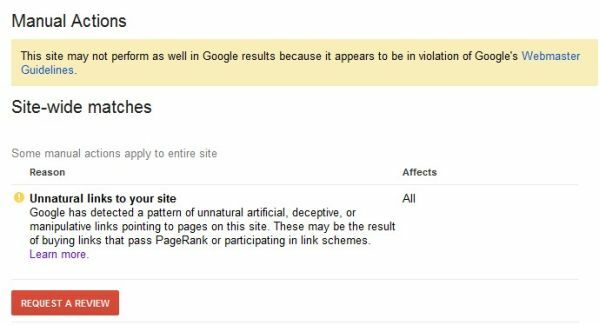 If you're currently working your way out of a penalty, you can always use my 12-Step Guide to a Google Penalty Removal. However, if you have a history of receiving manual actions, it's definitely time to invest in a pro. It's too easy to make mistakes, and they could be costing you big time. Because SEO and content marketing overlap in so many ways, many business owners assume all that's needed for high rankings is to continuously create new content. They believe that adding a new blog post every day or week will magically draw people (and search engines) to their business site. However, SEO is - and always will be - about more than just content. A successful SEO strategy will include three components: on-page optimization (which is where content comes in), off-page optimization and technical optimization. If you don't have the knowledge or skills to do all three, it's time to get a professional on board. While it's definitely possible to learn these skills and do your own SEO, many business owners prefer to spend their time actually doing what they're passionate about - running their business. If this is you, it may be time to outsource your SEO. According to Hubspot's 2016 State of Inbound report, 66% of marketers rate SEO as a top marketing priority for their company. 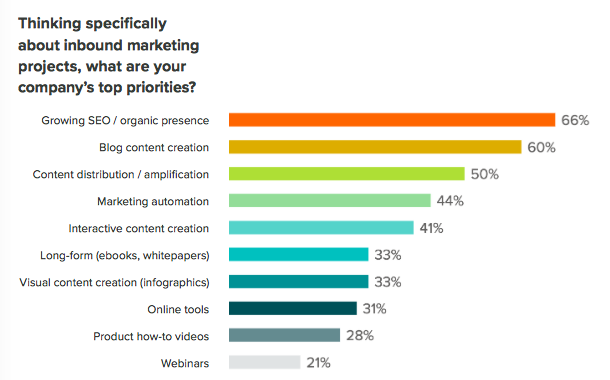 This makes SEO a higher priority than both blog content creation and content distribution. If you want to remain competitive, you'll need to make SEO a priority as well. If you're like many business owners, you may not have the time to do the balancing act that SEO takes. If this sounds familiar, let yourself off the hook and hire an SEO expert who will do their job to get high rankings for you. You only have so much time, energy and money to invest in SEO. Given the multitude of other important tasks that demand your attention, your SEO efforts need to be productive. As mentioned, you should expect to start seeing movement in the search engines in about 4-6 months. However, you should also be evaluating whether those increased rankings are actually driving traffic and conversions; not all keywords will drive lucrative traffic, even if you've achieved the top spot in the SERPs. If you're working like crazy and just aren't seeing a positive ROI, it's definitely time to invest in a pro. While this won't come cheap, the end result will be worth it. It's been estimated that Google makes changes to its algorithm around 500-600 times each year. While these won't all be big changes, some can have a significant impact on your website's rankings. Regularly consulting the Moz Google Algorithm Change History (above) will keep you up-to-date on the most important changes, as will subscribing to leading industry blogs like Search Engine Land and Search Engine Journal. However, if you don't have the time or interest in keeping up with these sites, hiring an SEO will give you confidence, knowing that being aware of these changes is part of their job. Most business owners have a pretty good grasp on the basics of SEO. They understand how on-page optimization works, and they know how to build links to their site. However, if your knowledge ends here, you could be setting yourself up for trouble. These are just a few of the issues that could get you into trouble. Fortunately, a dedicated SEO professional will know exactly what to avoid to keep your traffic and rankings flowing. Understanding general SEO is one thing, understanding local SEO is another. While the basics are the same, there are certain strategies you'll want and need to understand and implement if you want to rank for local search queries. For instance, your first step will be to register for Google My Business. 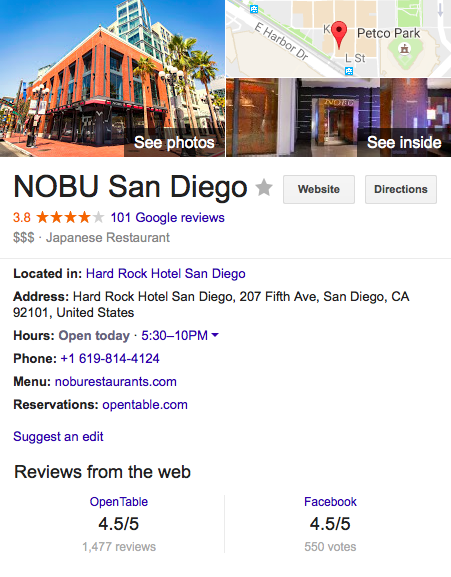 This will give you a free business listing in the SERPs, including a map, your hours of business and contact info. It will also allow you to collect and display ratings and reviews for your business. You'll also need to target keywords relevant to your local community. This will include city and neighborhood names, as well as industry-related words and phrases. For more info on the basics of local SEO, check out my post Optimizing Your Local SEO Using These 4 Basic Guidelines. There are tons of free keyword research tools out there that can help you find relevant keywords. Some of my favorites include the Google Keyword Planner, Keywordtool.io and HitTail. While these may be all you need to find high-value keywords, in competitive markets you will likely need the support that can only come from more robust, paid tools. There are many Tools that can take your keyword research to the next level, allowing you to find lucrative keywords your competitors are targeting. Unfortunately, some of the best tools come with a big price tag. Pro SEOs will already have access to these tools, meaning you get all the benefits of in-depth keyword research, without the learning curve or additional cost. If your SEO efforts are getting you the results you want, keep plugging away! Hiring an SEO isn't cheap, and if you're seeing a positive ROI, there's nothing wrong with going the DIY route. s it time for you to hire a professional SEO? Why or why not? Share below!